In July, I traveled to Northern Italy with my family. We spent 3 days/nights in Venice and 3 days/nights in Milan. After Italy, I flew with my brother and his girlfriend (cue the third wheel status) to Dubrovnik, Croatia. Dubrovnik was a magical city and I can't wait to explore more of beautiful Croatia. BOWA Dubrovnik: I like to do a lot of research before going on trips. So when I read multiple reviews about this spot, I knew it was one of a kind. Think of BOWA as a magical island only accessible by private boat x private beach club x food-lovers paradise. For ~$175 you get a 7-course meal, a private cabana and continuous service throughout your stay. We stayed for about 6 hours and enjoyed the quiet time and beautiful water. This is a MUST DO when you go to Dubrovnik. Here's a link to my TripAdvisor review for some more info. Konoba Dubrava: We were highly recommended this restaurant that is known for it's meat plate. And holy moly - the meat plate was delicious, but massive. If you're making reservations here, make sure to pre-order the meat plate as it takes a long time to prepare. The potatoes were to die for. Adventure Dubrovnik - Dubrovnik Sea Kayak Tour: Another highlight for us was kayaking in the sea and around the coastline. It was a welcome workout after a week of eating carbs, cheese and meat. We loved our tour guides and had a great time learning the history of Dubrovnik. Highly recommend! Gnocchi Making: My brother and I surprised my parents with a gnocchi-making class that we booked through airbnb. It was one of the overall highlights of our trip because 1. Francesco was a wonderful teacher and we really enjoyed hearing about his life 2. the Gnocchi was molto delizioso! If you're heading to the Venice area, reach out to Francesco and schedule a class. Peggy Guggenheim Museum: in order to get here from the main area in Venice, you need to take a boat. Generally, I recommend getting a pass for however long your trip to Venice is. The boat trip was very short, and the walk over to the museum was about 10 minutes long. We really enjoyed the entire collection and probably would have wanted to spend more time if we weren’t rushing to our next activity. Gondola ride: this is a very touristy thing to do, but still a really special way to experience the city. We booked a gondola ride in advance because we had heard that the lines get really long during tourist season. If you pre-book, be prepared to pay more than you would if you just walked up. There are a number of stations in Venice to choose from. Osteria Stella Anice: I had seen this restaurant highly rated on a number of travel sites and really enjoyed the meal. But, note that the restaurant’s kitchen closes early at 10pm, so I’d recommend making a reservation before 9:30pm J I enjoyed the hummus appetizer to start and the seafood pasta. Other members of our party got the pasta with truffles and it looked amazing. Osteria Enoteca San Marco: we had dinner here on our first night and loved it. The pesto pasta with burrata was incredible. 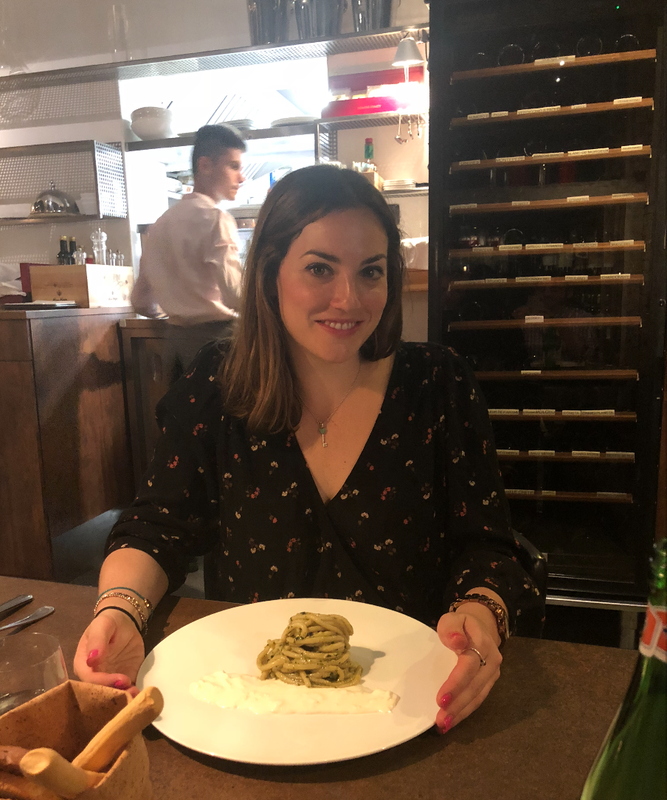 Osteria Oliva Nera: We were recommended this restaurant and enjoyed it immensely! We loved the squash blossoms (OMG!) and the white fish entrée was delicious, but the star of the meal was the lasagna! I so regret that I didn’t order it. Prada Fondazione: This is a museum/exhibition space in the outskirts of Milan. 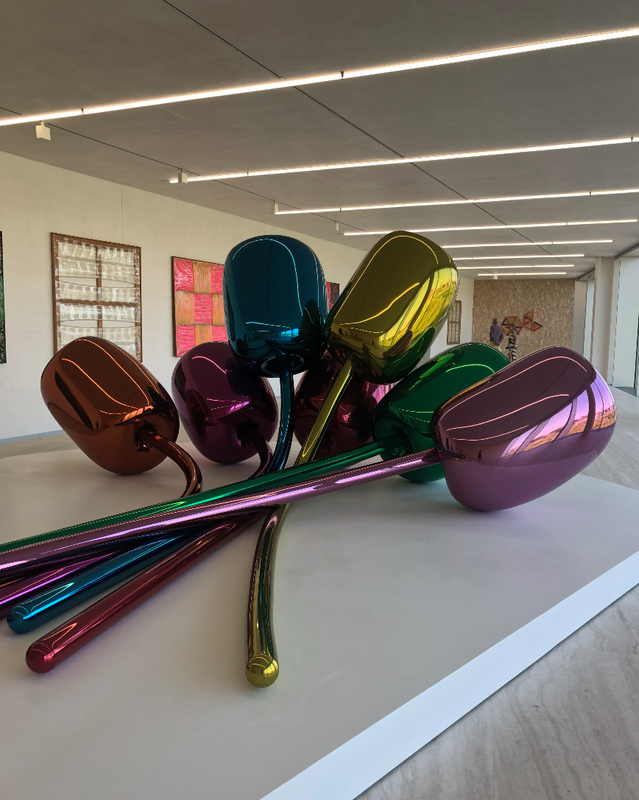 One of the highlights was checking out Bar Luce (a cafe designed by Wes Anderson) as well as the Atlas tower to check out art from Jeff Koons, Damien Hirst and Carla Accardi. Piz: We were recommended to eat lunch at this pizza spot and it did not disappoint. It was probably the best pizza we ate on our trip. YUM! Also, the people who worked here were very friendly and gave us champagne upon entry and shots of Limoncello upon exit (all for free)! La Prosciutteria: If you like prosciutto (and other meat) and lots of cheese, come here for their famous boards. By the end of our trip to Milan we were meat & cheese'd out, but still managed to find room to enjoy this meal. The Last Supper: If you didn't reserve your spot to go see The Last Supper, did you even really go to Milan? No description necessary - just go. I just got back from a 3-day road trip up the coast of California. I'm sharing some of my favorite spots that we visited in our jam-packed Memorial Day Weekend stay. We spent our 1st of 3 nights in Paso Robles. Although I wish we'd had some more time to check out a few more wineries, we still were able to enjoy the wine of the region! Paso is about a 3-4 hour drive from LA and is located inland in San Luis Obispo County. Old West Cinnamon Rolls and Espresso (Pismo Beach) - As a group of four, we devoured a walnut and an original. Please spend about 2 minutes staring and drooling at the picture of the cinnamon rolls above. De Palo & Sons (Pismo Beach) - In the same sitting as our cinnamon roll devouring, we also ate about an entire pound of De Palo & Sons' homemade mozzarella. A friend had recommended this Italian deli and we went HAM (pun absolutely intended)! Talley Vineyards (Arroyo Grande) - we brought all of the above-mentioned food to this winery and enjoyed it all while sipping on some delicious Chardonnays and Pinot Noirs. This was a gorgeous spot and worth a few hours of wining and dining. The Fableist - a few years ago, my mom and I were introduced to The Fableist's Cabernet Sauvignon. Since moving to California, I've tried looking for the bottle all over but haven't been able to find it and so was so excited to be able to check out their Tasting Room in Tin City. If you're unfamiliar, Tin City is a name for an industrial park in Paso Robles. If we'd had more time, we would have absolutely walked around and explored this area. Tooth & Nail Winery - this was such a cool tasting room nestled in a castle! Highly recommend checking it out because it's quite a magical experience. Fish Gaucho - this restaurant was POPPING and luckily we were able to put our name in for dinner and got seated in less than an hour. We ordered way too much food because our eyes were bigger than our stomachs, but I recommend checking out the Gaucho Nachos (OMG! ), and the BBQ Chicken Burro. Holy moly the food was good! 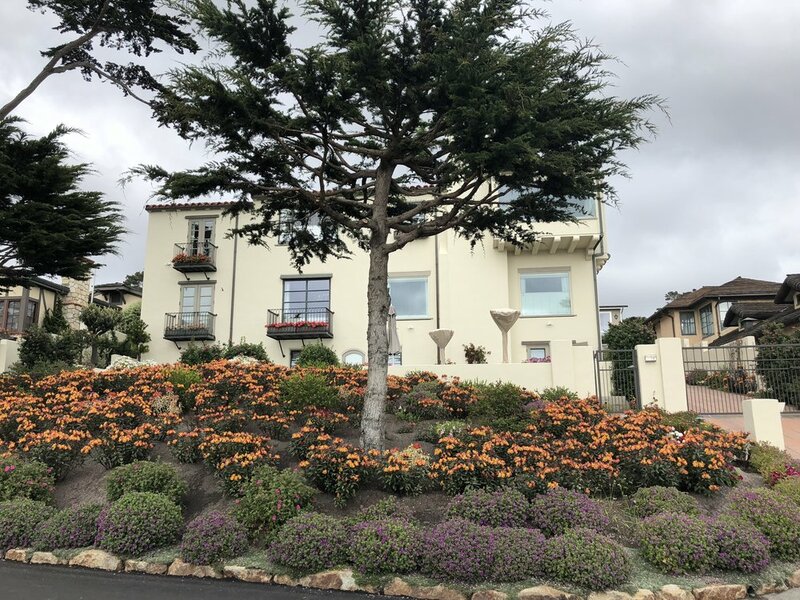 We stayed in Carmel for two nights, but because we booked our trip very last minute, all of the hotels and bed & breakfasts in downtown Carmel were sold out. 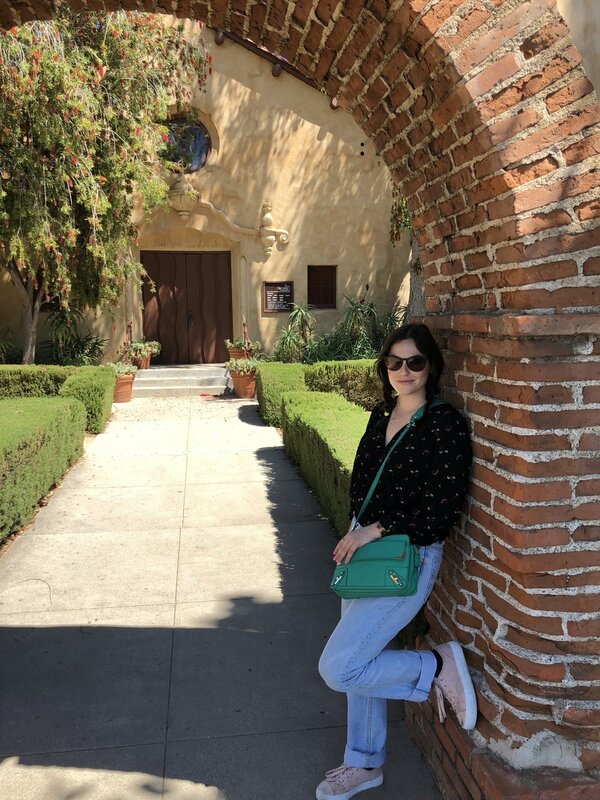 We ended up at the Carmel Mission Inn, which was perfect for a group of four and an easy drive into Big Sur as well as to Monterey and Point Lobos. Forge in the Forest - the highlight for this restaurant was the Cookie Skillet. Oh my goodness, this was delicious. We strategically ordered less for dinner to save room for this gooey deliciousness. Point Lobos State Natural Reserve - this was quite a magical place for sightseeing and definitely could have spent many hours here. We saw seals sunbathing (if you look closely, they're featured in one of my pictures above!) and cormorants nesting. There were 100s of nests that had been constructed on the sides of rocks - all the pregnant cormorants going through their pregnancy together. Too cute! A number of my friends sent over some incredible recommendations for the Carmel area - and because of our limited time I didn't get a chance to check them out. Here are some highlights of the places I'll visit when I head back to Carmel: Mission Ranch for dinner, The Bench (in Pebble Beach), Sunset Lounge at the Hyatt (Carmel Highlands), Lafayette Kitchen and Cafe. Many of you know that Big Sur experienced a massive landslide in 2017. For months, Highway 1 was covered and inaccessible. However, in late 2017/early 2018 most of the damage has been reversed. If you're planning a trip soon, make note that the only way to access Big Sur is by driving Southbound on the 1, because the highway is still blocked off past Gorda. I had never been to Big Sur before, and as an East Coaster had only heard of it through the song "Big Sur" by The Thrills from The OC Season 1 soundtrack (Ryan & Marissa 4ever). I assumed that Big Sur would have tons of beaches, but I could not have been more wrong. Big Sur doesn't really have any beaches. It is mostly an outdoor oasis with lots of hiking and miles upon miles of coastal driving. It was beautiful and very isolated - with limited cell phone connection spanning the entire drive. When I was planning my trip, I was surprised that when I asked people for recommendations they offered the same few places to stop - and that's because there are not many establishments. I'd highly encourage you to pack snacks because there's not a lot of places to stop! We did stop for a morning snack at Big Sur Bakery, which consisted of pastries/baked goods. They apparently also have delicious lunch and dinner offerings. We stopped by Nepenthe (a spot known for its incredible views), but by the time we arrived for a late lunch, they were completely booked for the rest of the day. Word to the wise - they only take reservations for 6+ people, so either get there very early to snag a seat, or skip it like we did. 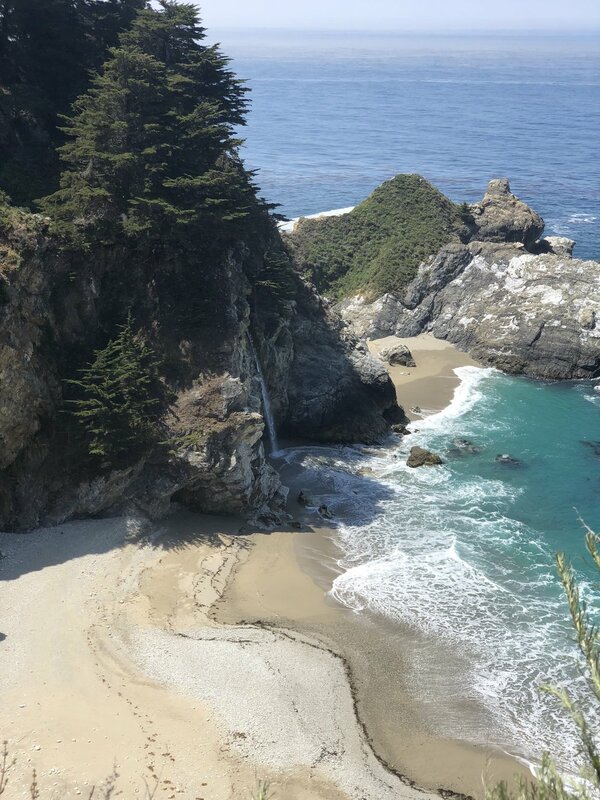 McWay Falls - this is not a hike. It is just an amazing photo opp and the most beautiful water. Limekiln State park - this is a moderate hike to a waterfall. You have to walk across a few creeks, so expect to get wet if you don't have great balance. Treebones Resort - I'd heard of this spot from a friend (shout out Karli!) and we ended up stopping by so I could grab a souvenir. Consider staying in one of their Yurts overnight! Also, as you drive over here you'll past an incredible field of pink and orange wildflowers. You can see them pictured above. Bixby Bridge - this is a famous bridge that you drive over when heading into Big Sur. But definitely stop for a photo opp! 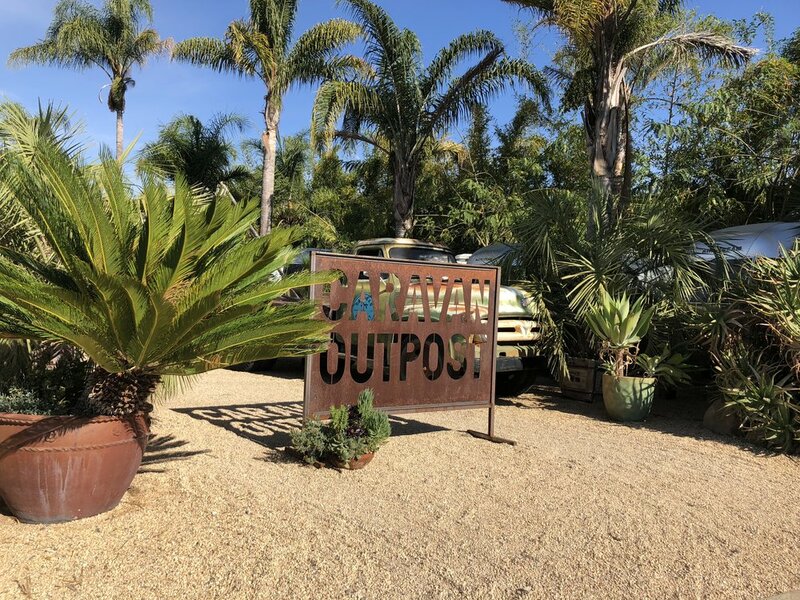 Caravan Outpost: This "hotel" is the ultimate glamping experience. 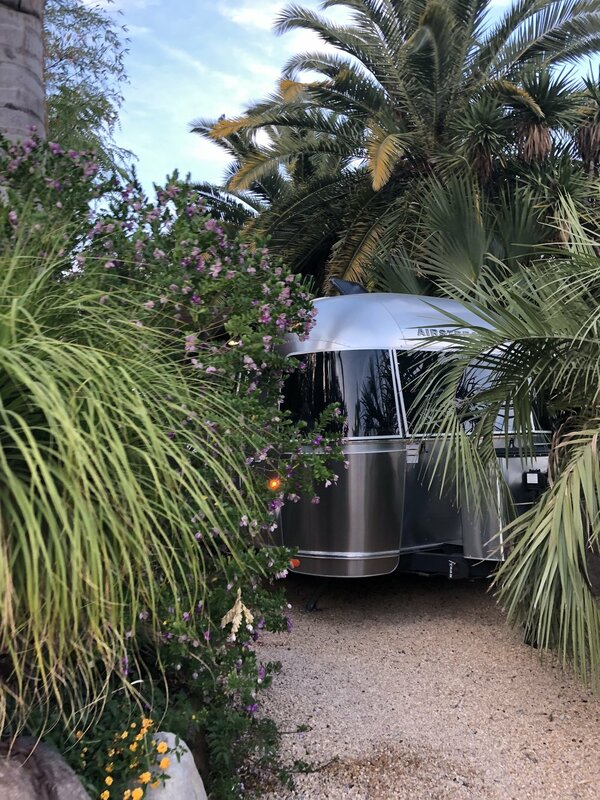 It features 11 Airstreams all with different names and personalities. My boyfriend and I stayed in Sam, which sleeps up to 4 and is not pet-friendly, but there are others that accommodate dogs. It was a very comfortable caravan with just enough room to prepare food and dance while listening to the record player/vinyl that came with the set up. I am not embarrassed that I danced alone to Donna Summer's "I Feel Love". Our favorite part of the experience was the bonfire outside that was lit around 6:00pm every night so that guests could cook and/or enjoy a cozy night in. On our first night, we decided to lay low. We stopped by a local supermarket to get some food to prepare "tin foil dinners". My boyfriend was a boy scout and went to sleep-away camp, so this was something he had done many times before. ...But we made sure to save room for dessert - Caravan Outpost provided us with ingredients to make s'mores! We had a perfect stay here! and left feeling completely refreshed. Food Harmonics: This restaurant offers Raw + Fresh + Organic food. We ate here for lunch on our first day in Ojai and were helped out by an awesome guy who gave us the full spiel of the restaurant's menu. He recommended the Salad Bowl topped with a Bison Burger (my boyfriend ordered Chicken on top instead) as well as the Raw Vegan Pizza. Both were AMAZING! Overall we spent about $35 for the two of us. Bonnie Lu's: My boyfriend found this spot after checking Yelp for recommended breakfast spots. It felt very retro, like we'd been transported back to the 1950s. We had a great meal - I ordered the Chorizo & Eggs which was SO GOOD with some hot sauce. My boyfriend ordered the Steak & Eggs, which he also really enjoyed. Overall we spent about $30 for the two of us. Azu: This restaurant had come as a recommendation from a friend (thanks Ali!) and the food did not disappoint. We ordered Buffalo Fried Cauliflower to share (very spicy, but delicious) and we each ordered a Pita Kebab - I got the Chicken Souvlaki and my boyfriend got the Braised Lamb. For dessert we shared an order of churros which were warm and cinnamon-y! We spent about $65 for the two of us. 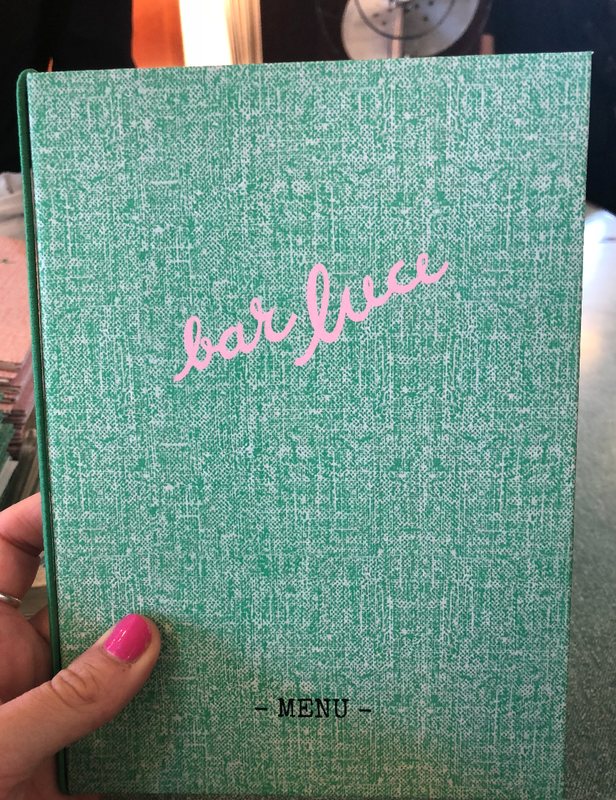 There were some other restaurants & bars that were recommended to us that we never had the opportunity to check out, hopefully we'll be back to do so soon: Boccali's, Deer Lodge, Farmer and the Cook (organic market), Osteria Monte Grappa, Revel Kombucha Bar.